After a weekend of back-to-back stops in Iowa at overflowing venues, Sen. Elizabeth Warren's voice was hoarse but her pitch was clear. 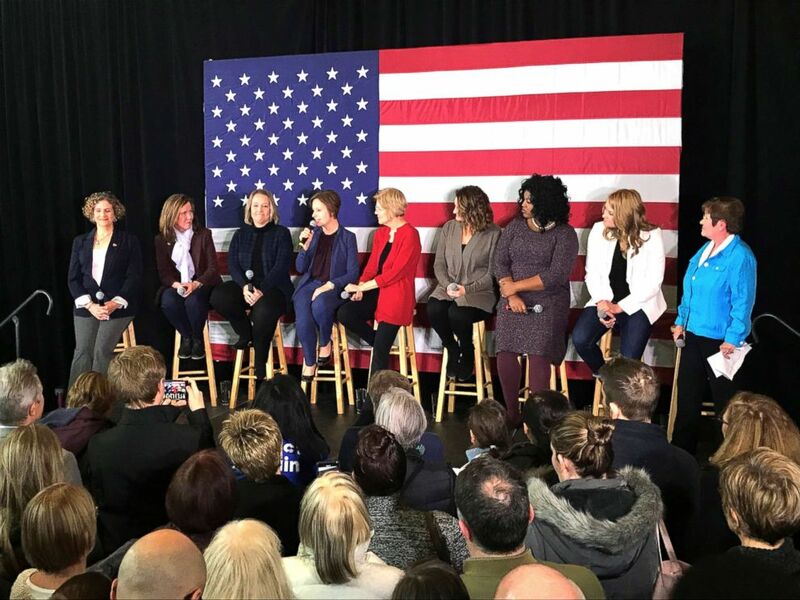 It was at the last stop of the trip, at a roundtable with women recently elected to local offices in Iowa, that cinched a strong message Iowans across the state had conveyed throughout the weekend as they waited in long lines or stood shoulder to shoulder in packed venues: It's time for a woman to be president. "We need a change. I think a female change is what we need," said Betsy Peterson, standing next to her husband and young daughter in a crowd at an earlier stop in Council Bluffs. And Warren, the first woman to announce forming an exploratory committee for 2020, illuminated that sentiment with her tour around the state. It's a state that all but guaranteed an excited reception: In the 2018 midterms, Iowa elected its first two women to Congress -- Rep. Cindy Axne and Rep. Abby Finkenauer -- its first female governor -- Gov. Kim Reynolds -- and sent a record number of female lawmakers to the Iowa Legislature. "I don't feel any letting off the pedal," said Theresa Greenfield, a former candidate for Iowa's 3rd Congressional District. "I haven't caught any woman that's said they're not going to do the exact same thing in 2020." Warren was not only the first woman but also the first high-profile figure to make a splash this election cycle. Her trip is the beginning of the 2020 election cycle -- still almost two years away -- and just as team Warren was wheels up Sunday, former Obama administration housing chief Julian Castro was finalizing details to touch down for a Monday event in the state. 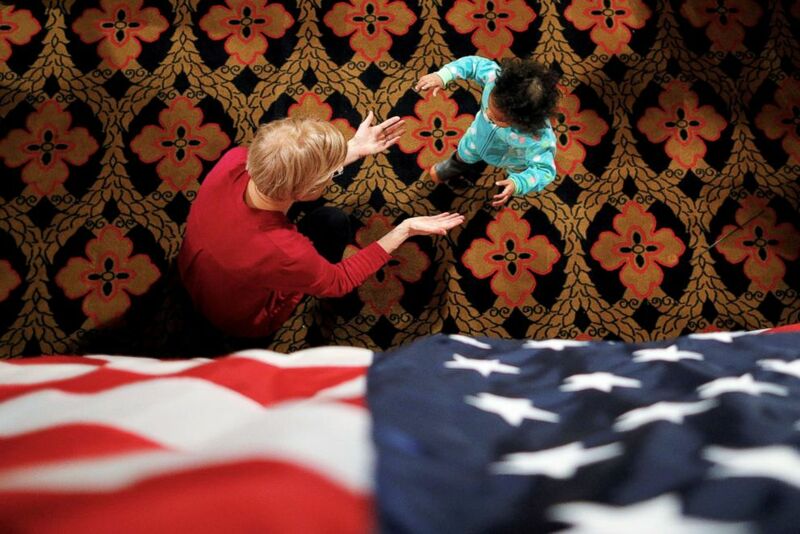 Senator Elizabeth Warren greets a young girl at an Organizing Event in Sioux City, Iowa, Jan. 5, 2019. At each of Warren's events, hundreds of mothers and fathers brought children, often donning shirts that read "Feminist," or "Nevertheless, she persisted." Around 700 attended an event Saturday night in Des Moines, and about 315 were at the roundtable with women leaders on Sunday. One such supporter was Jean Hessburg, who attended Warren's Sunday event in Ankeny with her 22-year-old daughter, Grace. As a former executive director of the Iowa Democratic Party who's been to hundreds of political gatherings, Hessburg said the Sunday event gave her chills. The conversation was free flowing, focusing on the struggles women must overcome to take office. "To have women, just women, sitting in a room together," said Hessburg, her daughter nodding in agreement, "and say so freely that they were embarrassed to lose, bare their souls like that, in a way no male politician would, just felt so terrific -- like I was in a girls club, like a cigar-smoking girls club, an exclusive only-girls club." Amber Gustafson, candidate for Iowa State Senate, incoming State Reps. and candidate for Iowa Secretary of State Deirdre DeJear sit around Sen. Elizabeth Warren at a roundtable event in Ankeny, Iowa, Jan. 6, 2019. Much of Warren's stump speech over the weekend focused on her humble roots growing up in Oklahoma and the challenges she faced in her rise to eventually becoming a U.S. senator, like getting a college degree while raising children. "We've been told before about what's too hard," she told the crowd in Des Moines. "People told me I could not get a toddler potty trained by her second birthday, and I did it," she said, eliciting laughter. She spoke of becoming the first female senator of Massachusetts. "People told me back in 2012 Massachusetts wouldn't elect a woman to the Senate," she said. "We got organized, we fought back and I am now the senior senator from the commonwealth." The crowd listens as Sen. Elizabeth Warrenspeaks during an organizing event in Des Moines, Iowa, Jan. 5, 2019. 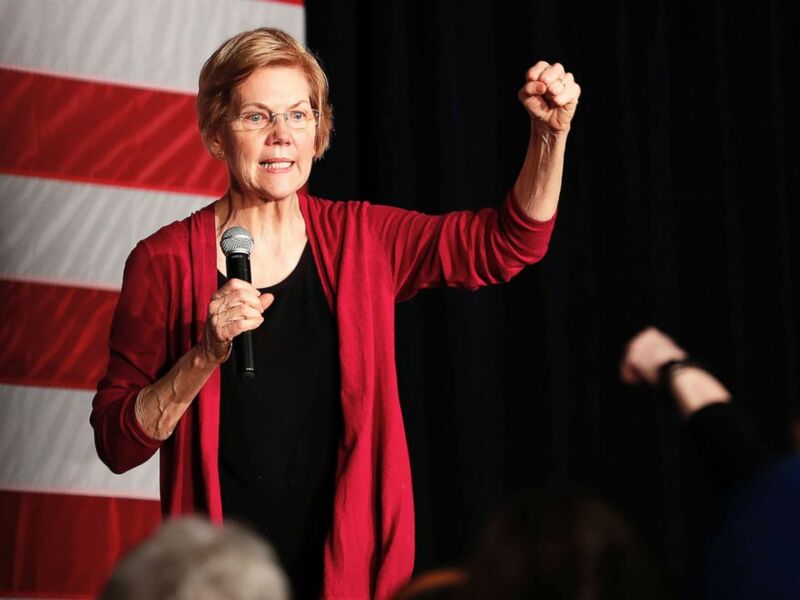 And while many know Warren as a former Harvard law professor, a progressive senator and a frequent target of the president's Twitter feed, she barely mentioned the elite school or the president's name, unless prompted. Over and over again, Warren focused on a close call with foreclosure on her family's home in Oklahoma as a kid, her three brothers and their service in the military, how she got into college and then dropped out young to raise a family before eventually -- and unexpectedly -- making the leap to Washington. Her message: Such a rise is rarely possible anymore. For Warren, the Washington of today doesn't work for the little guy -- a message not unlike Sen. Bernie Sanders', who did well in Iowa in 2016. "Why has America's middle class hollowed out? Why is the path so rocky for so many people and so much rockier for people of color? Why has this happened in America?" Warren said at multiple stops. "It's corruption, plain and simple." Iowans who heard her speak said her words resonated. Many said they had supported Sanders in the 2016 caucuses. Sen. Elizabeth Warren speaks during an organizing event in Des Moines, Iowa, Jan. 5, 2019. Brooke Smith, who crossed into Iowa for Warren's event from nearby Bellevue, Nebraska, said part of the excitement was Democrats' readiness for 2020 and hopes that it would deliver a similar victory as the 2018 midterms in the House of Representatives. 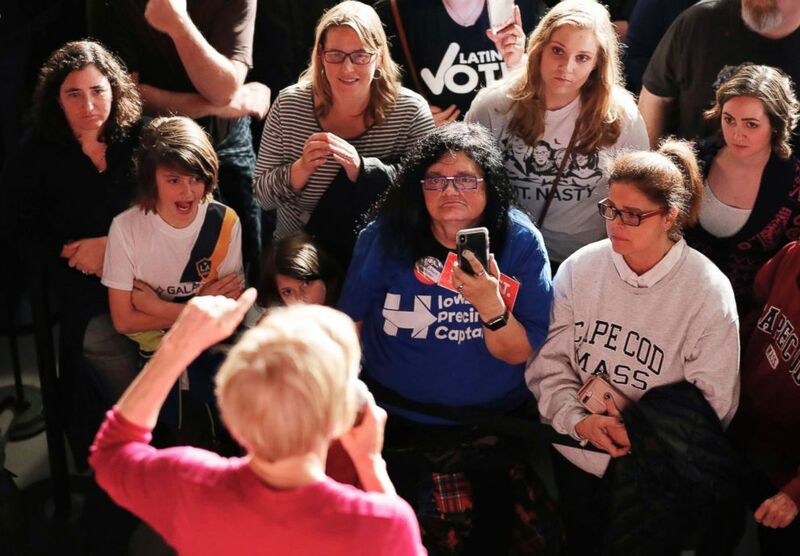 And on the question of so-called likability -- a term used to describe Warren that prompted an email from her team asking voters to donate when they get "frustrated" that more time is spent covering "Elizabeth or any woman's 'likability' than her plans for huge, systemic change" -- women in the crowd pushed back. Smith called the conversation "borderline sexist." Joanne Wilkinson, attending an event in Des Moines three years after she saw former presidential candidate Hillary Clinton in the same city, said there wasn't much to compare between the two women -- besides that they're both women. "I don't think likability has anything to do with it," she said. "It's a matter of, Can they do the job."